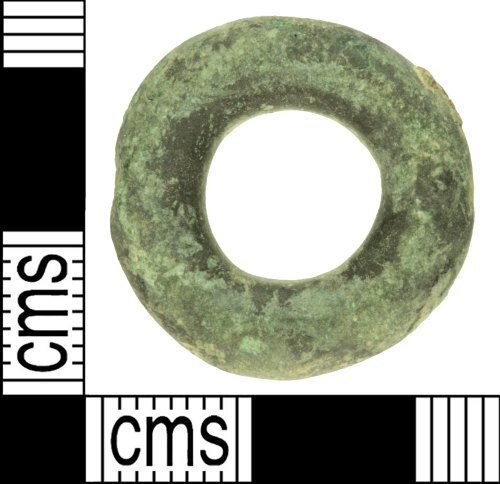 A copper alloy possible horse harness ring of Bronze Age to Roman date (c. 1000 BC - AD 410). The ring measures 20.95mm in diameter (internal diameter 9.9mm), is 5.75mm thick and weighs 9.13 grams. It is circular in shape with a defined circumferential ridge running around the centre and flattened faces above and below. The interior surface also features a defined circumferential ridge, creating a hexagonal cross section. The interior surface exhibits scratch or wear marks which appear to have occured during use. The ring has a pitted dark brown patina with patches of green.